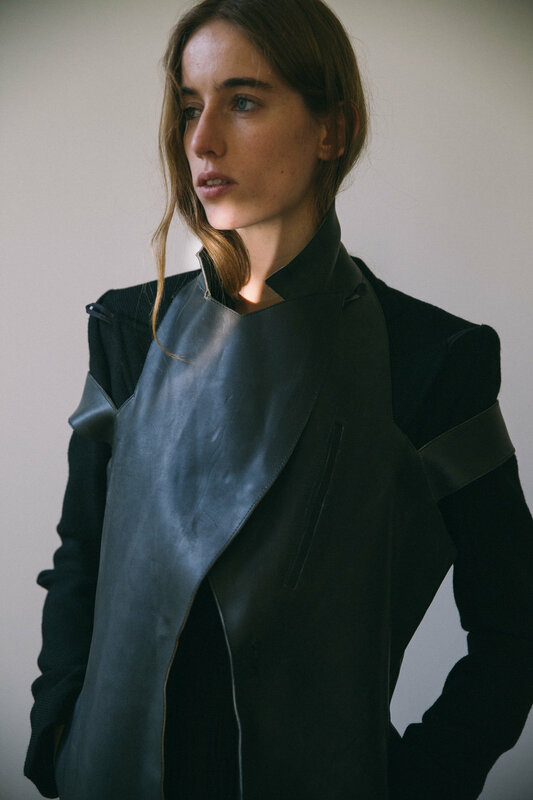 Meet Avyn Omel, the Canada-based Fashion Designer whose label AVYN is SOLs aesthetics made real. AVYNs sleek lines, clean cuts and soft silhouettes offers an aesthetic approach to womenswear that is a coming together of masculine and feminine and one that we at SOL simply adore. The soft spoken and beautiful Avyn spoke to us, from her home-away from home in Rome, about what inspires her, the world of AVYN and what makes a Fashion Designer in today's world. Did you always know you would end up in the world of Fashion? Clothing and costume were introduced to me as a pastime by my sister and my mother. That said it did not seem viable when I was young to work as a designer. It was through a series of fateful events I ended up studying in Italy and meeting a plethora of people who gave me an entrance in to the world where I find myself now. One of your earliest fashion memories that hugely impacted you and pushed you to your vocation? I grew up dancing in my mom’s dance studio. She would let me help choreograph, choose some music and have a part in creating the costumes from a young age. The satisfaction of feeling so many aspects come together through a performance is delightful. The process of creating a collection evokes a similar feeling in me today, so perhaps my pursuance of this path was subconsciously based on that. As a Designer aesthetics plays a vital role- what does it mean to you on both a professional and personal level? I think my aesthetics are fluid tendencies based on a reflection of what I have known and what intrigues my curiosity professionally and personally all the same. Your pieces are the result of creative research as well as a commitment to working with high quality craftsmen and mills. Tell us a bit more about this process. There are many steps to create and produce a garment. Every pass is an opportunity to apply the values of creativity, quality and play in order to produce something cohesively beautiful, desirable and functional. Working with people who are motivated by these values is important to me as it is visible in the physical outcome and emotional impact of the product. The human body, and how it moves and adapts to its environment. It is a big topic in my family. You can find bodies and movement of all kinds all around you. You have worked for conceptual designers including Chayalan- how does this experience influence your aesthetics? Applying concepts to the process of design and production provides a framework for translating the intangible into the tangible. Working in the studios of different designers it was possible to absorb, practice and evaluate methods to achieve this. For the most part this is reflected in my method of working rather than my visual aesthetic, although I suppose one affects the other. You are based in Canada- what do you make of the local Fashion scene? My studio in Canada is quite isolated and surrounded by nature. In that sense it can be very freeing to spend time working there because the isolation provides few distractions. On the other hand it is limited because there isn’t an abundance of people with the skillset I am looking for. For this I am grateful for the balance I maintain at the moment between Italy and Canada. How do you envision the future role of the Designer? For me a designer’s role is to work within restraints in pursuit of making something finite that puts us in touch with the infinite and ever-changing. As technology evolves so does the reality of the day-to-day of a designer however the goal remains the same. How do you envision AVYN in the future? Glancing down the path in front of us, we are focused on advancing our collection for women. Envisioning beyond that, we would like to propose conscious and subconscious awareness of human movement and impact it through design and collaboration with creative minds in that field. And Finally Three words for those who would like to pursue fashion as a career?